Potty training is not easy. You have to look for signs of readiness in the child, which can be as early as 14 months but is usually a bit later. To start with, teach your child the importance of using the potty, referring to it in playful conversations, and making it part of your lives. Let the child see that the toilet isn’t scary, and that it’s an important part of daily life. Sometimes potty training is the toughest part of parenthood. It can be frustrating and messy. Don’t let this show with the child, though. Accidents are normal, and if the child feels like he has failed, he will stop trying altogether. Praise him for using the potty, give him rewards, help him see how fun it is to be a “big kid.” It’s important to continue practising even when you are on vacation or away from the house, too. Another way to train your child quickly and painlessly is to read his or her favorite books together while he or she is on the potty. This can make the experience seem normal and even fun. Children can learn quickly at times, and you may be surprised to find your child progressing faster than you would have thought, without too much prodding from you. Trust them to go at their own pace. Trust them to be able to master toilet training successfully. Let them know that every day our body is making poop and pee, and that those things should be in the potty. Let them know how nice it is to wear “big kid” underwear instead of diapers all day. If your child feels the need to go, tell him to hold it and walk to the potty, to sit down comfortably and let go. If the child fails, explain that it’s OK and its part of learning. Every time she comes to you and indicates she has to go, praise her and smile. 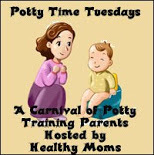 Timing is very important in painlessly potty training your child. Watch for signs that your child is ready for the process, and be calm and patient throughout it. For more potty training tips visit PainlessPottyTraining.com. Wow, I didn't know you could start at 14 months! I was thinking the beginning age was 18 months. . .but Logan (15 months) definitely is interested when I go to the bathroom (sorry TMI, haha) and how the toilet works, so maybe we can get him a child toilet now and start the process! I'll let you know when we do. Thank you for the comment about my book, it meant a lot!